This post originally appeared on ActiveHistory.ca. Last month, the mayors of Canada’s two largest cities met in Toronto, and the mood was positive. After discussing business partnerships, security, the upcoming federal election and—inevitably—hockey, Denis Coderre and John Tory announced a new era for relations between Montréal and Toronto. “The two solitudes are over,” stated the charismatic Coderre, who last made the news in Toronto for snubbing then-Mayor Rob Ford at the 2014 Big Cities Summit in Ottawa. Instead, he and Tory evoked a “strategic alliance” between the two metropolises, to be formalized with sister-city status sometime in the next few months. What this new partnership will amount to is anyone’s guess. Both cities could use some good news, after four years of Rob Ford’s drug-addled behaviour and the revelations of corruption made by the Charbonneau Commission. The big issues that Tory and Coderre hope to raise together in the upcoming election—infrastructure, housing, transportation—are crucial ones; but Ottawa has proved very able in ignoring similar campaigns in the past. Rather than predicting where this mayoral love-in will lead, I’d like to use the occasion to look back at nearly two centuries of real (and imagined) rivalry. It began with business. For most of the 19th century, Montréal was the undisputed commercial centre of British North America, the heart of what historian Donald Creighton called The Commercial Empire of the St. Lawrence (1937). Toronto, on the other hand, was something of a backwater, or at the very least an upstart. But by the 1880s that was changing, as railway construction, westward expansion, and increased trade with the United States all favoured Toronto as an economic hub. Over the next century, local boosters vied with one another for recognition and investment as both cities grew into modern metropoles. Which would be The Chief Commercial Centre of the Dominion? Who really cared? Some moments in this contest—like 1920s competition between the Bank of Montreal and Toronto-based Canadian Bank of Commerce for the title of “largest bank in Canada”—likely meant little outside of the mansions of the Square Mile or the corridors of the Empire Club. Others resonated more widely. In the wake of Québec’s Quiet Revolution and the rise of a Francophone business elite, the Toronto vs. Montréal dynamic took on a new importance for nationalists of all stripes. Insurer Sun Life’s 1978 decision to move its head office from Montréal to Toronto prompted outrage in Québec, as much for its symbolism—a century-old company fleeing the new Québec to an ascendant Toronto—as for the 1,800 jobs that would be lost. So, even as the idea that Canada could have a single “economic capital” lost credence (always a bit of a stretch in a country of regions), new reasons could be found to hope for the commercial success of one or the other city. 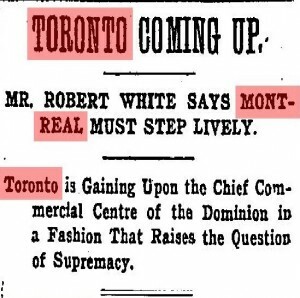 In fact, even before Québec and Canadian nationalism were thrown into the mix, there was a strong cultural element to the Montréal-Toronto contest. Google “Toronto vs. Montréal” and 90% of the results you’ll get are about hockey. Inaugurated in 1917, the rivalry between fans of the Canadiens (Habs) and the Maple Leafs is one of the longest and most heated in Canadian sports history. Is this a case of tensions built up outside of sports (in the streets, in politics) finding safe expression on the ice? Or is hockey actually one of the roots of this metropolitan rivalry? Probably a bit of both. Wherever it comes from, the Maple Leafs-Habs contest was and is important to Canadians—even if, a century later, some have pointed out that by any measure Montréal has come out ahead. 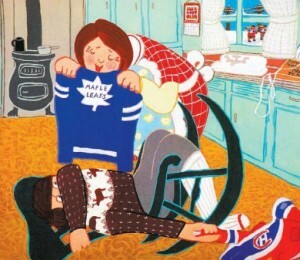 Who can forget the humiliation of the young Québécois protagonist of The Sweater, forced to wear an “abominable maple leaf” on the ice? There are many other ways in which Montréal and Toronto have been (or imagined themselves) in competition over the years. During the development boom of the 1950s and 1960s, politicians and developers saw the downtown landscape as the ideal place to measure their cities’ greatness in tangible terms. Montréal’s Tour de la Bourse (1964) was 194m tall? Toronto’s TD Tower (1967) would be 223m. 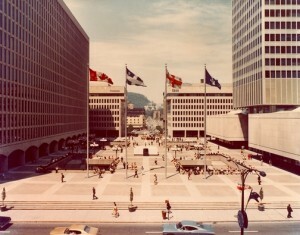 Under dynamic but polarizing Mayor Jean Drapeau, 1960s Montréal seemed to be building one of the most modern and exciting downtowns in North America, as exemplified by its whisper-quiet Métro and the Place des Arts and Place Ville Marie projects. In 1967 outspoken writer Pierre Berton argued that Montréal was “a decade ahead,” even that it had “solved the problem of the dying downtown” that urban leaders across the continent were trying so hard to address. But his real concern was that up-and-coming Toronto was going to be left behind by the more sophisticated Montréal. The quest for cool didn’t stop there. In the second half of the 20th century, Montréal’s anxiety about losing economic ground was matched by Toronto’s cultural inferiority complex. To some in both cities, Toronto the Good might have a big-city tax base, but it was still provincial, conservative, and above all, boring. Montréal, on the other hand, had relaxed liquor laws, real cafés and nightclubs; not to mention a thriving alternative to imported American culture that was often lacking in English Canada. It didn’t help that Toronto never really had a chance to strut its stuff on the international stage with an Expo or the Olympic Games: as the Gazette observed in 1971, Toronto got the bread, and Montréal the circuses. Over time, this kind of comparison has been muted, although some commentators still see Montréal as the bar against which Toronto’s hipness should be measured. Taking a larger view, there’s really nothing unusual about Toronto and Montréal’s long-lasting but (mostly) friendly rivalry. The world is full of similar relationships between important cities in the same state: think Glasgow and Edinburgh, San Francisco and LA, or Hanoi and Ho Chi Minh City. And that whole “two nations warring in the bosom of a single state” thing certainly hasn’t helped. But I’d argue that Canada’s historic urban rivalry is mostly just that: history. My unscientific reading of the zeitgeist in 2015 is that Torontonians and Montréalers don’t see themselves primarily as rivals—if they ever really did. Local matters, but not in the parochial, oppositional way that boosters or anxious cultural critics once imagined. I won’t go as far as Coderre in arguing that the two solitudes are a thing of the past. But the urban experience in Canada certainly leaves as much room for solidarity as for rivalry, something that I think the mayors tapped into during their press conference, once they got past references to tired old antagonisms (the Leafs, Montréal’s “cool” and all that). Friends at last? Only time will tell. 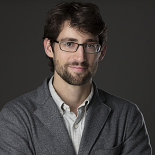 This entry was posted on May 4, 2015 by Daniel in Active History, Montreal, Toronto and tagged Montreal, municipal politics, rivalry, Toronto, urban history.